He was struck by a car that rammed through police barrier. Prime Minister Justin Trudeau speaking in between Minister of Infrastructure and Communities Amarjeet Sohi, left, and MP Randy Boissonnault, right, at the Fairmont Hotel Macdonald in Edmonton on Oct. 21, 2017. EDMONTON — Prime Minister Justin Trudeau praised an Edmonton police officer for his "exemplary'' actions during an attack in which he was run down and then stabbed. Trudeau met with Const. Mike Chernyk on Saturday during a visit to the Alberta capital and thanked the officer for his efforts, which the Prime Minister said helped save lives. "It is a testament to his strength, but also to his training and just to the excellence of first-responders right across this country that he was able to keep a cool head in the most chaotic and violent of circumstances," Trudeau said. Chernyk had been working crowd control outside a Canadian Football League game at Commonwealth Stadium on Sept. 30 when he was hit by a car that rammed through a barrier and sent him flying through the air. The driver then got out, pulled out a large knife and began stabbing Chernyk, who fought back as he was lying on the ground. Hours after Chernyk was injured, a cube van with police cars in pursuit drove down Jasper Avenue and hit four pedestrians. 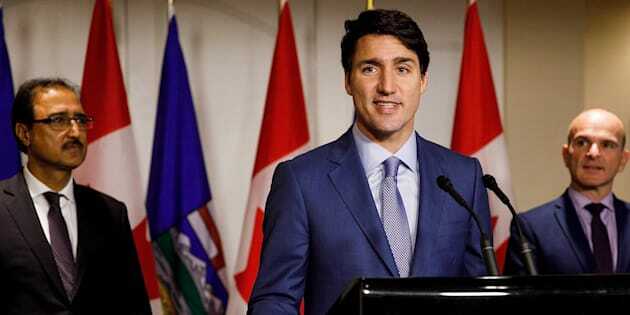 "On the morning after the attack I was, like so many Canadians, watching online in disbelief the footage of him being flung across the road and then viciously attacked," Trudeau told reporters shortly after meeting Chernyk and his daughter at Edmonton's police headquarters on Saturday. "His actions at that moment were exemplary, and I told him so." Chernyk, a 10-year-veteran, suffered stab wounds to the face and the head but was released from hospital relatively quickly. He is now back on the job. Over the last couple of weeks, Chernyk has been honoured at both CFL and National Hockey League games in the city. Edmonton Police Const. Mike Chernyk waving to the crowd before a game between the Edmonton Oilers and the Calgary Flames in Edmonton on Oct. 4, 2017. "I know that the terrorist attack earlier this month hit Edmonton and Edmontonians hard. I also know that the people who live here are good people. We look out for our neighbours. They offer a hand to those in need and they stand united against those who promote fear and seek to divide us," said Trudeau, who met earlier in the day with community representatives at a multicultural centre for newcomers. Police Chief Rod Knecht on Friday credited Chernyk's recovery to his being "a real resilient individual." Knecht said he has recently met with the last of the four to remain in hospital, Kim O'Hara, who suffered a skull fracture. Somali immigrant Abdulahi Hasan Sharif in this police booking photo provided in Edmonton on Oct. 2, 2017. A suspect, Abdulahi Hasan Sharif, a 30-year-old Somali refugee, faces 11 charges including attempted murder, dangerous driving, criminal flight causing bodily harm and possession of a weapon for a dangerous purpose. He was scheduled to next appear in court on Nov. 14 to face the allegations. Police said an Islamic state flag was found in one of the vehicles involved. Initially, police said terrorism charges were expected but none have been laid.